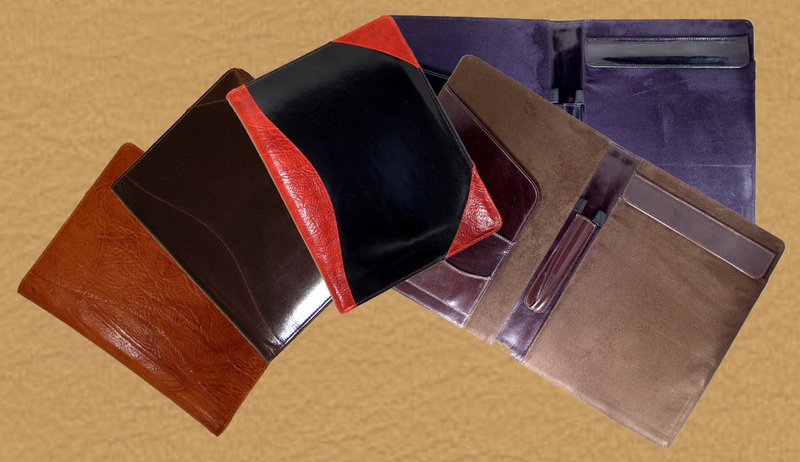 Letter Pad Portfolios may be crafted in your choice of leather finishes and colors. choice for organizing your materials. Roll over thumbnail to view. 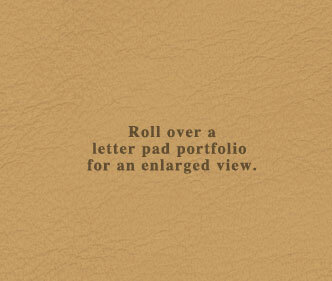 Our Letter Pad Portfolios are handcrafted from the highest quality materials available. Each leather panel is carefully selected and cut to dimension before being bound about a strengthened, moisture resistant core. Every care is taken to assure that each portfolio will be an impressive and useful accessory on the conference table, or carried into a meeting. This portfolio will be indispensable for years to come. I LOVE LOVE LOVE the Albums!!! They are way better than I expected and well worth the wait!!! Obviously I found them at the old house no problem! Just so excited about them! I can't wait to give you more business. My sister is getting married in May '09, do you have any wedding samples?